A durable concrete is one that performs satisfactorily under current exposure conditions for defined life of the structure. The ability of concrete to withstand the conditions for which it is designed without deteriorating or getting damaged for a long period of time is known as durability of concrete. The durability of concrete may also be defined as the ability of concrete to resist weathering action, environmental forces, chemical attack and abrasion and simultaneously maintaining its desired engineering properties. Durability of concrete normally refers to the duration of a life span of the trouble-free performance of concrete. Different types of concrete require different degrees of durability depending on the exposure environment and properties desired. For example, concrete exposed to tidal seawater conditions will have different requirements than indoor concrete in dry areas. The cement paste structure is dense and of low permeability type. Under extreme exposure conditions, it has entrained air to resist freeze-thaw cycle. It is made with graded aggregate that is strong and inert-type material. The ingredients in the concrete mix contain minimum impurities such as alkalis, Chlorides, and silt. Following are the factors that affect the durability of concrete. The quantity of cement used in the concrete mix is a major factor affecting the durability of concrete. gets reduced and concrete workability also gets decreased. Adding more water to this concrete mix results in formation of capillary voids which will make concrete a permeable material inviting deterioration. Adding excessive cement can create problems like drying shrinkage. Alkali-silica reaction may also occur which finally affects the durability of concrete. Using good quality aggregates in the concrete mix will surely increase the durability of concrete. The shape of aggregate particles should be angular and round. Flaky and elongated aggregates may affect the workability of fresh concrete making it porous and hence permeable and will also active less strength. Rough textured angular aggregates are recommended but they require more cement content for getting good bonding. Well, graded aggregates should be used to achieve dense concrete mix. Determination of moisture content of aggregate should be done before, otherwise, it can create a more workable loose concrete mix again making it porous. The water used in concrete mix also affects the durability of concrete. Normally, potable water is recommended for making concrete. pH of water used shall be in the range of 7 to 8 only. Water should be free and clean from oils, acids, alkalies, sugar, salts organic materials etc. The Impurities present in water may lead to corrosion of steel or deterioration due to different chemical attack on concrete. The care should be taken while placing the concrete. It is important to compact the place concrete without segregation. Insufficiently compacted concrete contains a number of air voids in it which reduces the concrete strength and durability and will render it porous. Proper curing should be done in the initial stages of concrete hardening as it will result in good durability of concrete. Insufficient curing may lead to the formation of cracks due to plastic shrinkage, drying shrinkage, thermal effects etc. due to which the durability decreases. Due to permeability concrete, it expands and lead to the formation of cracks and finally, the disintegration of concrete occurs. Normally concrete contains small gel pores and capillary cavities. However, gel pores restrict the entry of water through them since they are of very small size. To prevent permeability, lowest possible water-cement ratio must be used. Moisture available in the atmosphere will also affect the durability of concrete structures. The moisture in concrete is responsible for Efflorescence, which will convert salts into soluble solutions and when it evaporates salts crystallized and appear on the concrete surface. This will surely damage the concrete structure and durability will be reduced. When fresh concrete is exposed to a high-temperature, rate of hydration gets affected and strength and durability gets reduced. Concrete ingredient materials have different thermal coefficients, so at higher temperatures, spelling and deterioration of concrete may happen. Also read: Why Water Requirement is Higher for Curing rather than Making Concrete? Deterioration of concrete also occurs due to severe abrasion of the surface. When concrete is exposed to rapidly moving water, steel tires, floating ice continuously wearing of the surface occurs and durability gets affected. When moist concrete is exposed to an atmosphere, carbon dioxide present in the atmosphere reacts with concrete and reduces pH of concrete by reacting with CaO in concrete. When ph value of concrete gets reduced to 10 or 9 or more, it looses its alkali. Due to which it will not be able to protect the steel bars under it. Because of corrosion, the rust will form around the bar resulting in increase in volume of bar. This will cause crack in concrete. The cracks will further incite moisture and CO2 which will further make it lose alkali. Thus the vicious cycles take place, ultimately making concrete brittle with delamination and spalling of concrete if not attended in time, the bars will start losing its area and thereby strength. Most of the structure in today’s time, suffer from this, and buildings which were supposed to have life of 100 years have undergone major repairs sometimes within from 10 years. Hence the corrosion process sets in the reinforcement present in concrete. 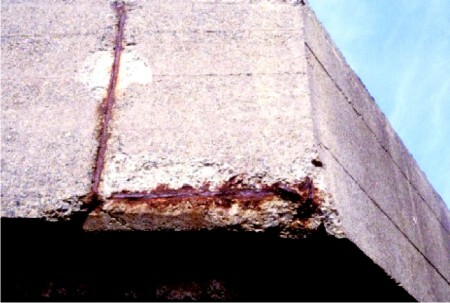 Corrosion of reinforcement causes cracks in hardened concrete and deterioration takes place. What are the Various Durability Tests on Concrete? The prime target of chloride attack is steel reinforcement which seeps through concrete cover in marine conditions. Even use of accelerating admixtures with calcium chloride also increase chloride content in concrete which ultimately advances to corrosion of reinforcement. Chloride is present in concrete in two forms namely bound chloride and free chloride. Bound chloride is produced due to hydration products and adsorbed on the surface of gel pores whereas free chloride causes actual corrosion of steel reinforcement in concrete. Limits of chloride content in cement are 0.1% as per IS 456:2000 whereas the American Concrete Institute (ACI) has laid more strict rules for chloride content. The electrical resistivity of concrete by Wenner probe method. When carbon dioxide from air penetrates into concrete to combine with calcium hydroxide to calcium carbonate, then the carbonation process gets started. The Pour water in concrete is nothing but water collected in small pores due to excess moisture. It is alkaline in nature and has ph value ranging from 12.5 to 13.5, which ultimately helps in producing thin moist layer around reinforcement which protects it from carbonation effects of oxygen and water and saves from corrosion. As the pore water comes in contact with excess carbon dioxide in concrete it results in dilute carbonic acid with ph value 9.0 and which is sufficient to destroy the thin moist layer of reinforcement and exposed to further corrosion. The rate of carbonation in concrete is dependent on the level of pore water, grade of concrete, the permeability of concrete, exposure conditions of concrete, depth of cover provided to reinforcement etc. The test is mandatory when exposure condition is severe and has high concentrations of carbon dioxide 0.3 % to 0.1 % in concrete. The depth of carbonation can be easily determined on site. Here the exposed broken surface can be treated with a dilute phenolphthalein solution in alcohol. If surface turns out to pink then it shows that calcium hydroxide is not affected by carbon dioxide and if no change is observed then possibly calcium hydroxide has carbonated i.e. Caco3 has been formed. Sulphate attack is majorly observed in sulphate rich conditions such as marine, sewage treatment works & sulphate bearing soils. Sulphates such as magnesium sulphate attack mainly calcium hydroxide, hydrated calcium aluminates, and even hydrated silicates. This reaction results in the formation of calcium sulphate & calcium sulphoaluminate as a product, which has approx 227% of the volume of original aluminates, which leads to an expansion in concrete and thus results in cracks & attacks of Sulphate on concrete gets accelerated by alternate wetting and drying conditions, mostly in tidal regions. Sulphate attack can be controlled by decreasing tri calcium aluminates (C3A) & tetra calcium alumina ferrite (C4AF). Sulphate attack can also be controlled by using sulphate resisting cement, quality control of concrete, use of air – entrainment agent, use of pozzolana, high-pressure steam curing and use of high alumina cement as sulphate is the most effective while considering the durability of concrete. Initially, an aggregate is considered inert but sometimes this show a distinct nature due to alkali-silica reaction. When water is mixed with cement, alkalies of cement turns water to caustic gel and when this caustic gel combines with the reactive silica content of aggregate to form alkali-silica gel of unlimited swelling, This increases osmotic pressure inside concrete matrix thus leading to crack development in concrete. The alkali-aggregate reaction can be controlled by selecting the non-reactive type of aggregates, use of low alkali cement, use of mineral admixtures such fly ash, surkhi, by controlling void-space ratio, by keeping check of moisture conditions and temperature. When the durability of concrete is considered when permeability becomes the main culprit in deterioration. Water seeps into concrete reinforcement through capillary tubes and cracks which results into exposed reinforcement for corrosion. A water penetration test is one of the important tests to determine the durability of concrete. As mega construction project giants like Delhi Metro Railway Corporation (DMRC) does not allow water penetration more than 10mm for an underground level. The durability of concrete is such a major aspect that each criterion deserves a detailed approach and as the environmental exposure of site conditions changes the desirable properties of concrete also keeps on changing. Next PostNext 3D Wallpaper Décor That Add Depth to Your Tiny Room!